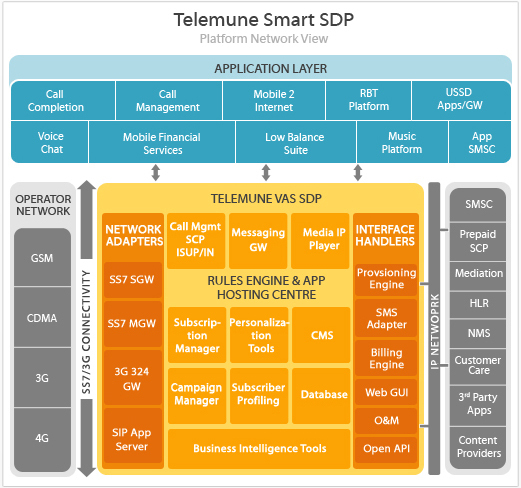 Smart SDP enables operators to quickly offer diverse service offerings to end users – all deployed rapidly and with flexible scalability. To facilitate user engagement, there are multiple access mechanisms and a flexible CMS to serve up varied and relevant content. To support operators, Smart SDP incorporates multiple tools, including personalization capability, a subscription manager and billing engine, that facilitate service on-boarding and user management, increase user engagement and simplify billing. Subscriber profiling and business intelligence tools deliver greater insights into user characteristics and usage trends to enable improved segmentation and targeting.